3R Macro Combi-2 Systems, 1 Chuck, 0 Adaptor! Macro Combi provides simultaneous access to Macro and Macro Junior System: 2 sizes of electrode holder in the same chuck! Macro Junior: large enough for the majority of all electrodes. The small size permits Macro Junior to machine very deep cavities. Manual Combi Starter Kit contains the necessary tooling to get started with System 3R's New Combi System. 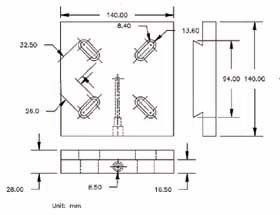 Manual chuck for vertical or horizontal mounting on machine table. Designed for use in turning electrodes. Comes with set screws for mounting on a lathe taper and centering adjustment. 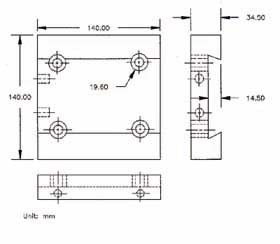 Electrode can be indexed 4x90�. 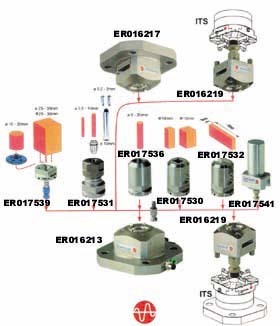 The standard mechanical interface between milling, grinding, turning, drilling, EDM die-sinking centers and measuring or presetting stations. 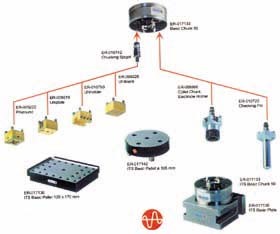 The economical tooling system with a high degree of precision and repeatability for flexible production. Owing to the combination of flexing and rigid components patented worldwise. 200-50AT (top plate) 8 Lbs. 200-50AB (bottom plate) 8 Lbs. 200-50AC (complete set) 16 Lbs. EHV10 315/16" 2 3/16" 11/4" 1" 4 Lbs. Parallelism and squareness are with 0.0002"/4"
EH20 29/16" 1" 13/16" 13/32" 3 Lbs. EH20S 29/16" 1" 13/16" 13/32" 3 Lbs. EH25 315/16" 17/16" 2" 11/16" 5 Lbs.